This is a nice image of GHK 929 a 1938 Leyland Metz ex Clacton on Sea this is rare in having bucket seats,bumper and hydraulic jacks its thought that it was intended for export but was retained due to the war. Great rig, Jason, and you have her preserved for us. Looks like she has a pump, as well. Added by Pat_R-B on 23 June 2008. Added by Tony White on 23 January 2009. Dont think that the 'Elf and Safety' people would appreciate his riding position! Added by Barrie Green on 24 January 2009.
this picture was taken in 1983 and was part of the park opening i am sure health and safety issues were all taken care of! Added by Jason on 24 January 2009. Added by Mike Cotton on 18 May 2011. That was for sale on E Bay a few months ago from a Devon owner, fully restored. Added by Ron Henderson on 18 May 2011. Aha ok - missed that one Ron, does anyone know where it may have gone? Added by Mike Cotton on 22 August 2011. I have photographs of ghk929 at clacton fire station in about 1939 at the station in Old Road and at the later Station at Rush Green road. The engine can also be seen in use at a major fire at Lewellens hardware shop in Pier Ave Clacton on 4th June 1939. 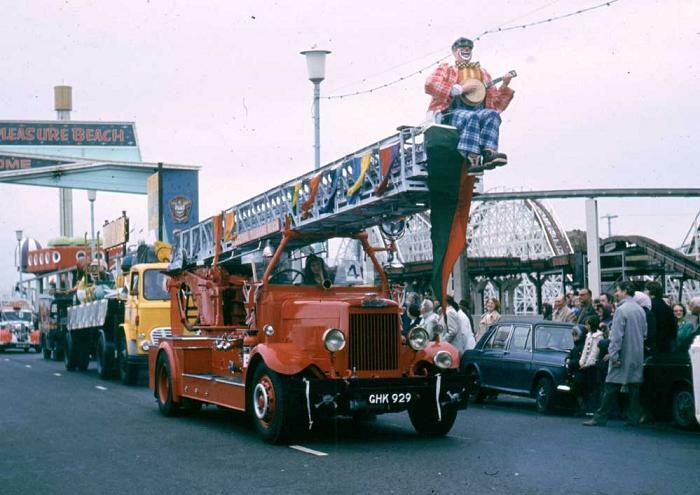 My father served in the Essex Fire Brigade from 1939 to 1976 at clacton and is photographed with it. He is also at the top of the ladder at the Pier Ave fire. Added by Ken Howard on 03 July 2012. If the current owner would like to contact me I can let him\her have some copies of old photos. Proof of ownership required. Added by Ken Howard on 14 July 2012. Added by Paul Fryer-kelsey on 03 December 2012. I have the engine plaque from this engine. Does anyone know of the owner as I would love to reunite the vehicle with it? Added by Jason on 21 November 2013. I have recently found GHK 929 in a private collection.It is still in very good condition and is well looked after. Added by Ken Howard on 29 July 2015. I have recently visited GHK 929 it is in a private collection and is being well looked after. Added by Mike Cotton on 30 July 2015. Is the small reservoir topped up? Added by Jason lester on 31 July 2015.